A top secret recipe that can only be described as the daddy of all day vapes. A fruity undertone and a cool crystal after sensation that will leave you wondering what it is… and wanting more. Where to begin… Well first off we want to thank our friend Euan for first telling about this magical juice, got to love it when someone gives you a tip on a great bit of kit. Second thanks to our friends over at E-Cigarette Direct for sending this along to us for review. Now let’s get into it. We can start by saying that Vampire Vape’s Heisenberg juice is automatically in our all time top 10 favourite juices! It’s just that good. Don’t mistake this with other juice companies takes on a blue juice sharing the same name. This one is in a league of its own. It’s hard to say what the exact ingredients are and of course the description doesn’t say much. But we can say for sure it’s a Fruit Menthol that consists of Berries and Anise for sure. There is one point to raise, there is a decently strong note of Anise in this juice, so if Anise or Black Liquorice isn’t your thing you may have some trouble. But again the balance of this juice and the amount of Menthol beautifully offsets any negative qualities some may have with Anise. This is some seriously artful mixology. 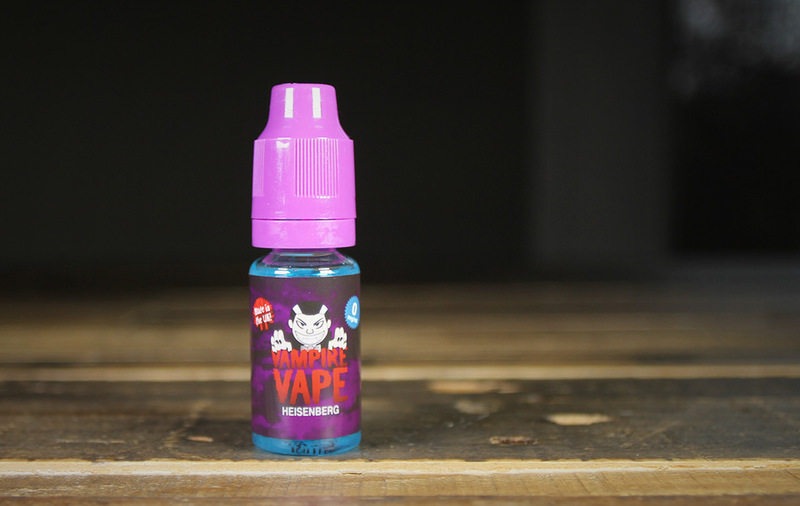 Vampire Vapes is famous in the UK and it needs to get more exposure to the North American market. Other flavours are hard to pin down, all we can say is you get sweet, yet tart Berry and other Fruit notes. We reviewed the higher PG version and can’t believe how smooth and clean it vapes. After a couple tanks in the new Kayfun [lite] we see nothing but shinny new coil (review to come on the Kayfun soon). Everything aside, you have to experience Vampire Vape’s Heisenberg for yourself if you are into sophisticated and complex profiles. The shipping cost may hurt a little, but boy it will be worth it! We are thinking about ordering more right now (which is super rare for a reviewer with a shelf full of juice waiting for review). Rave done, go get some!